The Sandwichman has started a facebook group called Greenest Elephant in the Room and fondly invites all EconoSpeak readers to join. 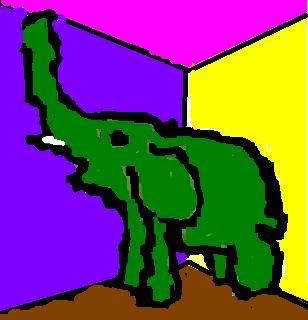 There will be a Greenest Elephant in the Room contest, too! No one can avoid noticing an elephant in the room. But respectable folks somehow know it's not polite to mention that it's there. In response to the City of Vancouver's upcoming "Greenest City in the World" initiative (it will be announced sometime this week), the Greenest Elephant in the Room is dedicated to raising the "forbidden question" of reducing the workweek. It's the most immediate and direct way to reduce material throughput while preserving and even creating jobs. Yet even as the current economic and environmental crises make the reduction of working time more urgent, serious proposals to do so are treated as curiosities from the fringe. Why is this so? The Greenest Elephant in the Room suspects that there are a lot of economists, politicians and other respectable folks who would rather be silly than look silly by marching out of step with their silly peers. As John Maynard Keynes remarked of bankers, "Worldly wisdom teaches that it is better for reputation to fail conventionally than to succeed unconventionally." I have long maintained that the biggest elephant in the room, of whatever color (but green seems appropriate), is the apparent-to-me fact that there are already somewhere between 2 and 100 times too many human beings on this planet. No one mentions this. If it is mentioned, no one offers discussion. Can we agree that human overpopulation is the _second_ greenest elephant in the room ? "Can we agree that human overpopulation is the _second_ greenest elephant in the room ?" No. It's not even an elephant. And generally it has a fairly disreputable history. This is an issue I brood about a lot. What is the carrying load of the planet? How many people do we want to have? Who decides the right number, and how to we get there? However, since we have so many people, many of whom cannot find jobs, a shorter workweek makes sense. A shorter workweek seems to make sense only while the output is decreasing. If the shorter workweek becomes mandatory and the output rebounds, then firms should employ more people for any given output, what means that cities would see more commuting than would be necessary before _ and that not spells good for a greener environment, IMHO. Thank you, Hermenauta, for restoring my faith in the inventiveness of you folks who just know deep down there must be some reason why not but you just can't put your finger on it! If forty people work five days a week, that's 200 round trips commuting. If fifty people work four days a week, that's 200 round trips commuting. 200 = 200.